This masque is a life-savor, it has so many wonderful ingredients that can be used on the most sensitive skin (including my own!) 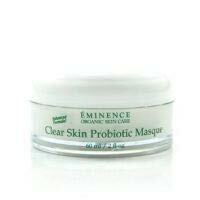 I highly recommend trying this masque; although it is pricey, a little goes a long way and it is worth every penny. You can order it through amazon for a discount, but their are many local spas that carry it if you use the location finder on their website. This is a "hot" mask -- which means your skin will feel tingly, and hot for some... follow the directions and only leave it on your skin for 5-10 min. any more will clog your pores... follow directions, and this will not happen. Great for reducing breakouts, keeping breakouts at bay, and healing hyperpigmentation. Lactic acid and vitamins in a creamy mask that goes on like a body butter and sets like clay, but not like clay - there's clay in it. So cooling it's almost uncomfortable at first, but ends up being very soothing treatment mask, the best of clay, peel and moisture at once.